The second shorter work in the Brothers Sinister series. I definitely prefer the novels to the shorts. This one definitely has some interesting scenes, but I found the hero difficult to swallow. Which is too bad, as I love the heroine to pieces. Great Christmas readI had no complaints. Normally, there's at least something, but this story was exceedingly enjoyable, the writing amazing, and it made sense. 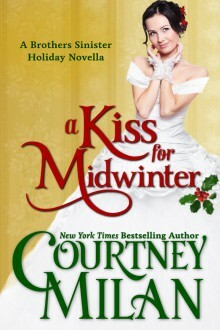 http://northamericanwordcat.booklikes.com Cat's Books: Romance 5.0 A Kiss For Midwinter (Brothers Sinister, #1.5) by Courtney Milan 5 Stars! text A Kiss For Midwinter (Brothers Sinister, #1.5) by Courtney Milan 5 Stars!